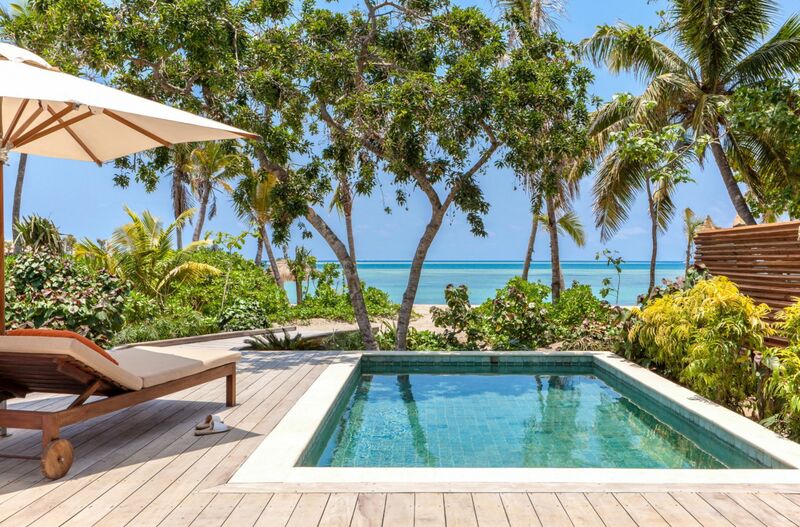 Six Senses' successful blend of wellness, luxury and sustainability has garnered a cult following, so while Fiji, an archipelago of over 330 islands, is not short on uber-luxe resorts, the brand's April debut on Malolo was highly anticipated. The fact that Malolo, which is part of the Mamanuca group of islands, is relatively close to the international airport on Nadi just makes it easier to get there. The resort, modelled on a typical Fijian village by New Zealand architect Richard Priest, sits peacefully above a secluded bay which boasts sand the colour and texture of cashmere. Its crowning glory, an expansive four-bedroom residence perched on a hilltop, offers a breathtaking, panoramic ocean view. Guests can sleep well in the knowledge that their very comfortable accommodations, and the various amenities available, are powered by the largest Tesla microgrid in the South Pacific. Although it is a major international brand, the Six Senses experience is not predictably similar in all its locations. Here, it starts with a traditional Fijian welcome–a song belted out by staff, as you arrive at the Bula Mai, or welcome bure (pronounced "mburey") after a 35-minute private speedboat ride from Denarau Marina on the main island of Nadi. The welcome bure also hosts luxury surfing academy Tropicsurf, and Hauraki Adventures, a Kiwi company contracted to handle scuba diving and excursions. A display of sea sports gear in shades of turquoise and cobalt, from Tropicsurf and Hauraki, echoes the marine theme, further inspiring one to take to the blues of the surrounding waters. A visit to the main reception, otherwise known as the Guest Services bure inside the "village", is dispensed with (though you have to check out there). A friendly Guest Experience Maker, otherwise known as a GEM, will do an in-room check-in for you. The distinctive Six Senses’ in-room look–pared down furnishings that look uber-luxe despite their simplicity–is immediately recognisable, especially by those who love the brand (like me). What's also expected is the indigenous details woven into each property by its individual designer, that pay homage to the culture of the host country. The interior of the beachfront pool villa I stayed in has a mahogany floor, and boasts a handmade mattress made with organic materials. Local influences include the turtle motifs in the wood panel carvings on the villa's wooden beams, which are tightly bound by natural fibres. The ceiling is made of woven soga (palm leaves from an indigenous Pandanus tree). Old black-and-white photos of Fijian tribes adorn the walls. The wooden sundeck by the private plunge pool looks out into the bay. If you enjoy soaking in moonlight, a large standalone stone bath in the outdoor shower area allows you to enjoy a relaxing bath while being serenaded by cicadas. A stay at any Six Senses resort is not complete without checking in to the spa. Here, there are currently four treatment bures where guests can be pampered; feel free to pick from the many types of massage–like the Fijian Bobo massage with herbal poultices–or facial treatments on the menu. Guests who are staying for more than three nights might want to sign up for a wellness screening with wellness director Deepak Rawat, who will recommend a personalised programme, or one of the programmes that Six Senses has put together in consultation with well-known experts. These programmes target issues like sleep, diet, weight loss, or even fitness. Yoga classes, both group or personal, are taught by consultant Mahesh Murali in the treetop yoga pavilion. We heard that Murali will also be conducting aqua therapy sessions soon. There are three main restaurants here. Tovolea, located in the heart of the property, next to the Guest Service Centre and many of the villas, offers all-day healthy South Pacific dining. Think tuna tartare and Fijian favourites like kokoda–a cured raw fish dish. Friday nights are lovo nights: Chicken, beef, duck, lamb, and even a local sweet potato called kumala are wrapped in banana leaves and buried under hot stones to cook–quite similar to how the Maori in New Zealand do their hangi. Other indigenous ingredients such sea grapes and otta fern heads, foraged by the kitchen staff, find their way into some dishes on days when they are available in sufficient quantity. RaRa is where one can indulge in Southeast Asian foods like masaman curry, or pad thai noodles. And there’s Teitei pizzeria, which also serves up nosh to movie buffs at the outdoor cinema next door. Executive Chef Ihaka Peri has taken the Eat with Six Senses programme, which espouses creating low-sugar, low-fat, gluten- and hormone-free options, to a whole new level. There’s an on-site bakery that makes wheat-free breads (many of the recipes are from Victoria Kruse, wife of general manager Jason Kruse). There’s also a fermentation lab on the premises. My mocktail–you can have it spiked–made with pineapple peel had the fizz and fermented whiff of beer without the alcohol. It was so delicious, I ordered another. After all, it was chock-full of probiotics. Don’t miss out on the myriad underwater attractions of the Mamanuca islands. Fijian waters are home to a high diversity of coral and marine life, including sharks. Though the famous shark dives with bull sharks and tiger sharks are not available here, you’ll still get to see many whitetip and blacktip reef sharks as well as the occasional bull shark. Those who are not certified to scuba dive may opt for a guided discovery dive that will take you less than 12m underwater. During this dive, you will be closely watched, maybe even handheld, by a scuba instructor. You can also opt for a guided snorkelling trip. Your guide will give you the lowdown on safety guidelines and keep a close eye on you. Fiji Airways (www.fijiairways.com) operates the only non-stop, twice-weekly 10-hour service from Singapore to Nadi International Airport on the Airbus 330-200. The cabin crew are hospitable and warm, a worthy representation of the spirit of the Fijian people.